Rumors of her demise have been greatly exaggerated. Love her or hate her, Article III Groupie is still around -- and so is UTR, which last month passed the milestone of over 400,000 total hits (on the strength of web surfers running searches for girls with thongs, girls showing thongs, girls in thongs, etc.). A3G has been a bad blogger over the past few weeks. She has been getting killed at work, which unfortunately won't be changing anytime soon. And she has also been very busy outside the office -- exercising assiduously (and losing five pounds),* watching the absolutely addictive Project Runway,** and gearing up for the Oscars (which she found boring this year, despite the best efforts of Chris Rock). But now A3G is back to blogging, at least for the time being. With apologies for the undue delay, she is pleased and proud to present her latest Questions Presented interview: a conversation with the manifestly magnificent Judge John D. Tinder, of the U.S. District Court for the Southern District of Indiana! A lifelong "Indy" resident, Judge Tinder was born in Indianapolis in 1950. He graduated from Indiana University in 1972 and from Indiana University School of Law in 1975. After graduating from law school, he accomplished the impressive feat of going directly into the U.S. Attorney's Office (i.e., without having to toil first in a Biglaw salt mine). After serving as an AUSA for several years, Judge Tinder left the office in 1977. Over the next few years, he worked in private practice in Indianapolis, was a public defender for the Superior Court of Marion County, and served as Chief Trial Deputy for the Marion County Prosecutor's Office. In 1984, Judge Tinder returned in triumph to his former office, as the U.S. Attorney for the Southern District of Indiana. In August 1987, as a fresh-faced lad of only 37, Judge Tinder became a district court judge for the Southern District of Indiana. Boy, that was fast! Enough of A3G's prattling. Let's hear what Judge Tinder has to say! Per UTR standard procedure, A3G's questions appear below in italics, and Judge Tinder's answers follow in ordinary roman type. Also, due to its impressive size, this interview will be presented in two parts. Today's post will contain the first ten questions and answers, and the rest of the interview will follow in a subsequent post. A. Working with a wonderful staff. It is a privilege of this work that jobs in the federal judicial system are highly coveted, and the supply of talent far exceeds the number of available positions. I am blessed to be surrounded by bright, hard working, interesting, fun people who make me appear to be better than I am. B. The interesting work. Almost every case that passes through this court is different in some way, and all but the few routine matters (e.g., mortgage foreclosures) present challenging legal and factual issues. This is the type of stuff that inspires people to go to law school. The best description of the work of a federal district judge is that it is like an endless bar examination. For example, in any single day, I might work on a state tort matter, a federal civil rights case, a constitutional challenge to a state law, a patent case, a motion to suppress in a criminal case, and an employment discrimination case. There are several differences between this work and a bar exam, though, that make it a good deal more tolerable, such as, it is “open book,” I have the assistance of two extremely bright law clerks, and I set the time for completing the decision. It is easy to get tired doing this work, but it is impossible to become bored. C. My colleagues on this court. This district has one of the highest caseloads per judge in the country (3rd in weighted cases per judge in 2004). Yet, each of my colleagues on the district court works at full throttle to keep the cases moving along. We each come to this work with different backgrounds and experiences, and we each bring talents that, in my opinion, serve the public well. Plus, my colleagues are very bright, kind and decent people, and are fun to be with (even when golf is not involved). D. The extended court family, from the Magistrate and Bankruptcy Judges, the Clerk and her staff, the staff of our Pro Se office, the Probation Office, etc., all of whom are top-notch. I cannot say enough about these people. E. The lawyers. Indiana is fortunate to have a remarkably talented and civil group of people practicing law here. For the most part, they work hard, fight vigorously when it counts, but respect each other. I think this is a wonderful place to be in the legal business. But see below in the Worst Parts. F. Jurors. Each case I try reinforces my belief in the jury system. These are loyal citizens, who work very hard to understand the facts and law of the matters presented to them. They have many talents and experiences in the real world that they put to good use in solving the problems put to them. They work under difficult circumstances, doing things that are alien to their normal lives, and they do it very well. They are interesting people, each with a unique story. It is fun to get to know them. I actually keep in touch with some of them after their jury experiences. For example, one young man who served in one of my very first jury trials keeps in touch with me about many of his major life decisions. By the way, I served on a jury in our state court system about 10 years ago. This experience heightened my empathy for jurors. I. Naturalization ceremonies. There is no thrill greater than presiding over the ceremony in which new citizens are administered the oath of citizenship. Our court conducts about two dozen of these ceremonies a year and we all enjoy doing it. This is certainly more fun than sending someone to prison. Per Judge Tinder: "[This photo was] taken after a December 2004 Naturalization ceremony. I ordinarily greet each new citizen after the ceremonies and hand them their citizenship certificate. They often like to pose for photos. 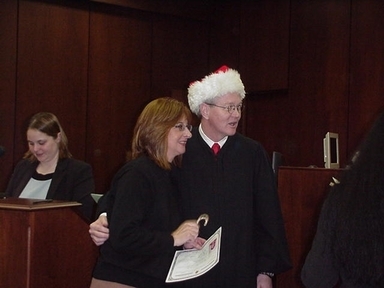 After that ceremony, I wore the Santa hat and handed each new citizen a candy cane with their certificate." A. The endless flow of work. I would love to be able to go home one day each week, or even one day each month, knowing that all of the things that I could have done to move my workload to completion had been done. In over 17 years in this job, I have never had even one of those days. There is so much to do on so many cases that much goes undone each day. Even in the midst of time away from the office, thoughts will pop into my head about cases that have been lingering too long in my office. Guilt learned from 12 years in Catholic schools and a sizeable number of challenging cases make for a nasty combination. It would be a great thrill to walk into my office some morning to a clean desk to start on a brand new slate of cases. It isn’t going to happen. B. The Lawyers. Some (fortunately, a small number) can be, simply put, jerks. Given the opportunity to be kind, considerate, fair and efficient or mean, rude, overreaching and sloppy, this small crowd will often choose the dark side. I have observed these types treating my staff poorly, being rude to jurors, their opponents and witnesses, and even being cruel to their own clients. At times, I wonder why they went into a service profession. I also have a low threshold of tolerance for niggling, despite the fact that this is the favorite sport of some lawyers. C. Advising criminal defendants of their rights, pursuant to Rule 11 of the Federal Rules of Criminal Procedure, prior to accepting a guilty plea. I suppose that I have done this over a thousand times in the years that I have been on this job. This needs to be a meaningful and informational process for each defendant -– their rights, the penalties, the consequences of a plea, etc. can’t be rattled off in a rapid fire and rote way (as I suspect Miranda rights are done by some law enforcement officials out in field). It is a constant challenge to explain what cross-examination is to a person with a 7th grade education, who is looking up at me with a frightened expression, and who is really more interested in knowing how long he is actually going to have to serve in the joint rather than hearing a detailed explication of the Sentencing Guidelines, the 5th and 6th Amendments to the United States Constitution, etc. To do this several times a week is one of the few repetitive and boring things about this job, but it also is one of the most important things, and sometimes I have to fight not being bored at these hearings. D. Fact-intensive summary judgment issues. This occurs most often in the employment discrimination area, but summary judgment motions in all types of cases are more often the rule rather than the exception. It isn’t so difficult to know what the law is in a particular field (usually), but the determination of whether certain evidence is admissible, and if so, whether the evidence permits or precludes the entry of summary judgment, can be a tedious and time-consuming task. I would guess that an average summary judgment process takes between 40 and 60 hours of judge/law clerk time to plow through. It is not uncommon that the briefs and evidentiary materials in these cases constitute a two or three foot pile of paper. Rarely are facts not in dispute, and it can take a great deal of time to determine whether the disputed facts are material to the legal issues. E. Scattergun theories of recovery and defenses. As I write this section, I am taking a short break from preparing for an emergency preliminary injunction hearing on business interference dispute. The facts are not complex, but the complaint pleads 14 different theories, from Sherman and Clayton Act violation to state law negligent infliction of emotional distress. The adverse parties are two adoption “consultants.” The facts can probably be addressed in an hour or two. To do justice to 14 different legal theories and the multiple defenses they will spawn could mean that some of the adoptees will be adults before a ruling is issued. I have never been able to understand why a litigant needs a dozen theories when a couple will do nicely. 2. How does federal judicial service compare to your pre-robescent expectations of it -- any big surprises? I suppose that I thought the criminal side of the business constituted a bigger part of the work than it does. I think that is a common but mistaken view of many in U.S. Attorneys’ offices. I have learned that, in reality, it is really only a small fraction of the work. Also, perhaps because I was never a law clerk, I had a poorly developed sense of the vast array of types of civil cases that pass through here. District judges are the ultimate generalists. Even now, 18 years into this, I frequently encounter theories of recovery and defenses that are new to me. Additionally, I thought I had some sense of the demands of the job, both in terms of the mental challenges and the length of time at work. I soon realized that my perception had only skimmed the surface. I have also been surprised to learn that those demands don’t diminish over time, and if anything, they have increased. 3. You were appointed to the bench at the phenomenally young age of 37. (Curious UTR readers: To find out who was the youngest federal judge ever appointed, click here.) In this interview at How Appealing, Judge Frank Easterbrook, who became a federal judge at a similar age, stated, "My appointment came too soon... If it had been possible to plan a career, I would have stayed in the academy (practicing and consulting, say, 20% of my time) another 15 years or so." Obviously, you can't kick an Article III appointment out of bed, and you don't look a presidential commission in the mouth. But if you had your druthers, would you have taken the bench later on in your legal career -- i.e., do you think that you were "too young" when you became a federal judge? I did not come to this job as part of a plan. The opportunity arose at a particularly advantageous time, and I sought the job before really thinking about whether it was a job that I wanted to do for the remainder of my professional life. I hope that I was not too young from the perspective of the litigants, that is, not mature enough professionally to competently preside over the important issues presented. I would like to think not, but I leave the evaluation of that to the lawyers and litigants who passed through here. The longer I do this job, the more that I appreciate that it is work that requires tremendous energy, interest and alertness to do it well. It is not a job to which one retires in the sunset of a legal career. These are working judgeships. Because my wife is an active trial lawyer, the experience of stress and anxiety of presenting a trial to a jury from a lawyer’s perspective is still fresh to me. There are similar drains on a trial judge, although not as intense for each trial, though the average judge tries many more cases each year than the average trial lawyer. Even among these trial experiences, a judge has to be on top of his/her game in dealing with motions in the hundreds of other cases sitting on the docket. There is no down time after one trial is finished. So, youthful energy and exuberance is not a bad thing for a federal district judge to possess. But more to the point, if I could have known to a certainty that I would eventually be appointed to this job, I would have rather started the job nearer 50 than 37. I came to this job from 3 ½ years in perhaps the best and most fun job that a lawyer can have, United States Attorney. Besides the exciting, important and fun things that the U.S. Attorney’s Office was doing in this district, I was privileged to be involved with U.S. Attorneys from virtually every other district in the country as a member of the Attorney General’s Advisory Committee. I take pride in having served as a U.S. Attorney during the Reagan presidency. In my opinion, some of the finest lawyers in my generation served in that role during those 8 years. To list them all would constitute a who’s who list of the American legal profession. Your readers would recognize many of the names, such as Rudy Giuliani, Bill Weld, Frank Keating, Asa Hutchinson, Joe DiGenova, Dan Webb, Sarah Evans Barker, Bob Bonner, Tony Valukas, Jim Richmond, Larry Thompson, Jeff Sessions, and so on. Anyway, that was great work. I would have liked to have done that for several more years before leaving, and the opportunity to do that type of work ended with this job. I also had hoped to do some things in private practice after leaving the U.S. Attorney’s Office to further my skills as a litigator, and, of course, to earn a little money. Frankly, I enjoyed the practice of law, being able to do things for clients that they could not accomplish on their own, the camaraderie of lawyers, the independence, getting to know your clients and their families, etc. I would have liked to resume that and more fully experience that world before moving on. So, I would have liked to start this job later in life in order to do those things. I originally intended to work at this job for about 5 years before deciding whether I wanted to continue to do it. That 5 years very quickly became 15, and by then, there is no looking back. But, I have no regrets about my choices, and I look forward to continuing to doing this work for another ten years. 4. Based on your own experience as a federal judicial child prodigy, what secrets can you impart to us concerning how to become a federal judge at a ridiculously early age? As for getting an appointment to a federal judgeship at a young age, it is really no different than being appointed later in life. The secret is to be at the right place at the right time. It is no harder than that. Of course, the trick is that no one can know in advance where the right place is, or what the right time will be, so you have to make some very good guesses and be very, very lucky. The circumstances of my appointment were extremely fortuitous, and are probably not an exemplar for anyone else. Had it not been for the help of some very kind friends and public officials, I would probably be sitting in a tiny law office right now, preparing interrogatories instead of answering your questions. During 1986, two of our district judges took senior status within several weeks of each other. Prior to Sarah Evans Barker’s appointment as district judge in 1984, the last Republican appointment in our district had been in 1954, so I figured that if I might ever want to do it, this was probably the best, and perhaps only, time to try. Besides, as U.S. Attorney, I did not have a client base that would scatter if signs of my interest in a judgeship surfaced. I suspect, too, that when a U.S. Attorney is in the hunt for a federal judgeship, it may discourage other potential applicants. At that time, the Senators from Indiana (Lugar and Quayle) had an elaborate merit selection process in place to develop potential nominees to send to the White House. The entire process from submission of an application to the Merit Selection Commission to appointment took about 18 months, the longest 18 months of my life. I was among the last nominees to be considered by the Senate Judiciary Committee and the Senate before the Robert Bork Supreme Court nomination was to be taken up in the fall of 1987. I considered myself lucky to get finished with the process when I did. It was a walk in the park compared with the current judicial nomination environment, but it was more anxiety for me than trying cases. As for aspiring federal district judges, regardless of their ages, there are certain patterns in background experiences that seem to be common in lawyers who are eventually appointed. Here are the ones that come quickly to my mind: experience in litigation; service in the state judiciary or as a federal Magistrate Judge; service as a U.S. Attorney, AUSA, Attorney General or state court prosecutor; some political affiliation and involvement (but not as a political terrorist); some active involvement in a bar association, especially committee work that accomplishes projects for the community good; some active involvement in community affairs. It helps to have a combination of several of these experiences. Although I don’t have any statistical evidence to back this up, I suspect that a fairly large percentage of federal judges served as federal law clerks upon graduating from law school. Of course, even though a federal judicial clerkship is not a certain step to taking over the judges’ job, I think there can be no better experience for someone who ultimately serves in this job. It certainly gives the clerk a very good insight into the variety and demands of the job. If I could make one suggestion to a person who is interested in becoming a federal judge, it is this: make certain that your financial needs don’t prevent you from working at the modest wages that most public service jobs pay. You need to be able to commit yourself to working on projects that may not pay well for a period of your career so that you can have the type of experience that will get you noticed when judicial appointments are available. If your lifestyle demands an ever increasing income to keep your bills current, you will be unable to endure the financial sacrifices that public service requires. I am not suggesting that it is wrong to make a lot of money. However, needing a lot of money will make it difficult to be involved in the types of things that can result in a federal judgeship. If you become a judge, your income growth will be relatively flat, so you need to be able to live comfortably with that limitation. 5. Speaking of finances, federal district judges currently earn $158,100 a year, which might seem like major ducats to an average American. Compared to what these brilliant legal minds could make in private practice, however, it's chump change -- less than what a judge's clerk might make in her first year of post-clerkship practice at a big law firm. Do you believe that federal judicial salaries are too low? It is easy to make the argument that federal judicial salaries are too low, but it is pretty hard to make it persuasively enough to create a public outcry for an pay hike. To the average worker, our salary would be a life’s dream. But anyone knowledgeable about the legal profession understands that the work performed by federal judges, if done in the private sector, would yield a much larger amount of revenue. Similarly, the legal profession recognizes that many talented lawyers simply aren’t able to seek federal judicial appointments because of the financial demands of supporting a family. But there are other benefits and amenities associated with this work that are not found in the private sector, such as the tenure, the lack of client development, bill collection, offices expenses, etc. that make it enough different so that a direct correlation to the practice of law is not realistic. I don’t know that there is an exact way to discount for these differences. Several Presidential commissions in recent decades have recommended sizeable pay increases for federal judges, and they have made the case for a pay raise with far more information than I could muster. I recall reading somewhere that a good measure of comparison would be to peg judicial salaries at the average for law school deans at top tier law schools. (I would, though, like summers off and sabbaticals, too.) I don’t think much will ever change in this regard as long as our salaries are linked to Congressional pay. I am sure that there are some in Congress who would point out that even if our pay was frozen at this level for years to come, there would still be lawyers standing in line for these jobs when openings occur. That is true, but I don’t think the public is well served if the people who aspire to this job are ones for whom this employment would constitute a pay raise, if the best people for these jobs do not seek them because of the expenses of raising a family or if judges’ pay does not match the rising cost of living. When I was first appointed to this job, the salary was $89,500/year, which was actually a big jump over the preceding year in which the salary was $75,100/year. So, the current pay is a living wage for me, especially since my wife is employed and we do not have children. But many of my colleagues face much greater financial demands than we do. 6. A clerkship with a federal judge is a highly coveted post -- and deservedly so. What qualities do you look for when hiring your law clerks, and how do you conduct your clerk hiring process? An ideal law clerk candidate is very bright, usually from the top 5 % of a good law school. Some real-world legal experience is helpful, such as work as a summer associate at a law firm or a summer internship, preferably doing work which involved a heavy dose of legal research and writing. I prefer to receive a writing sample from the applicant’s work experience. That type of writing sample will tell me much more about how the applicant writes under the pressure of actual facts and deadline pressures than anything written at law school. Law school research papers, moot court briefs or law review notes may be interesting, but they aren’t much help to me in determining how a person might wright in the court environment. Most importantly, a clerk needs to be a very good writer coming into the job. His/her writing skills will improve, but if they are not fundamentally good legal writers to begin with, this is not the place to try to learn. There is not enough time during a clerkship to start from scratch in learning how to write, or to unlearn bad skills. The writing sample submitted with an application should be clear, concise, complete and correct, and achieving those things should be the objective of each draft while clerking. Beyond the academic and work achievements, and the research and writing skills, I look for what could be called the “intangibles,” which are best described as a willingness to work remarkably hard and long to get the job done, good common sense and a compatibility with me and the others in the office. In a work unit this small, if one of us doesn’t mesh well with the others, the atmosphere can sour quickly, and productivity is shot. To get a good perspective on this, my law clerks and my assistant also interview the individuals I am considering for a clerkship. I value their views on the candidates. One of the happy, yet frustrating, things about the clerk hiring process is that many, many of the applicants have all of these qualities, and I can only hire one of them during each hiring cycle. Most of the applicants are recent law school graduates but each year I receive several applications from lawyers in practice who are seeking a transition from practice to something else. I usually interview between 5 and 10 applicants. Most every person I interview could do the work well and fit into the office. I have one career clerk, who has been with me for over seven years. The other position is ordinarily for a term of one or two years, although I have had clerks for longer and shorter periods. I am attempting to adhere to the hiring schedule and procedures that are the product of a judges’ committee to standardize the schedule throughout the country. The schedule and requirements of the Law Clerk Hiring Plan for 2005 & 2006 are posted here. I post my hiring information on the Federal Law Clerk Information System (“FLCIS”) website, which can be found here. 7. Former clerks of yours contacted by A3G raved about their fabulous clerkship experiences with you, giving you props for being "an extremely nice and easy-going person," with "a great sense of humor." How would you describe your relationship with your clerks, both during and after the clerkship? During: Law clerks are my legal advisors, and sort of my eyes and ears to the real world. At the early stages of a case, there is only time for me to get a tree top view of the legal issues, or to do a quick read of voluminous deposition transcripts and documents. I rarely have the time to do detailed research from scratch on legal issues. I need to have law clerks who dig through every piece of paper in the file, to conduct thorough research, independent from the briefs submitted by counsel, to emphasize for me the things I really need to know about the facts and the law to make an informed decision. I suppose that the role of a law clerk is comparable to that of an associate in a law firm working with a partner on a project. We work as a team in trying to find the best solutions to the cases before the court. The focus of what we do is on the particular cases that need to be decided and the issues presented by them. Of course, the bulk of the work is research and writing. However, there are some opportunities to observe oral arguments and witness testimony. Naturally, we will occasionally have informal discussions about what goes on behind the scene in a trial, such as why lawyers took certain approaches in their presentations or why witnesses testified as they did. A clerkship won’t teach a young lawyer everything he/she needs to know about litigation to become a capable litigator, but it would be difficult to leave a clerkship without some significant insight into the litigation process. Regardless of the area of law that the clerk goes into, I hope they leave a clerkship with me with a useful sense of how and why difficult decisions are made in litigation. A clerkship revolves around the work, but by working so closely, we get to know each other reasonably well as individuals. We have lunch together occasionally and have “special events” from time to time. For example, we had a case recently which involved a trademark issue regarding certain automobile models that were manufactured in Indiana during the early years of automobiles. At about the same time, the Indiana State Museum featured a display of several of these antique automobiles so the staff and I visited the exhibit to see several Auburns, a Stutz Bearcat, etc. I would feel that a clerkship went well if the clerk left feeling that he/she worked hard, learned something about litigation and had some fun along the way. After: The shared experiences bring us together, just as when you try a series of cases with a co-counsel. In some sense, it has been the two of us against the world, and that creates some bond that will last, hopefully, a lifetime. We have office reunions from time to time, although I have fallen a little behind in scheduling those in the last several years. Former clerks often drop into the office when they are nearby. I also meet former clerks individually for lunch from time to time, at least the ones who have remained in central Indiana, and I often look up those who have moved elsewhere when I get to their cities. We also keep in touch through email, telephone and the occasional card. I consider them to be a good friends, advisors and a resource/contact for me, and, I hope, that they consider me in the same way. I am always delighted to hear about their career interests and more personal matters like the growth of their families. 8. In 1994, you participated in a conference sponsored by the Indianapolis Bar Association examining bench-bar relations, lawyers' frustrations with judges, and judges' frustrations with lawyers. Some of the findings and recommendations from the conference appeared in a very interesting and insightful memorandum from you that was published in The Indiana Lawyer on December 14, 1994. In the memorandum, you noted concerns expressed at the conference concerning improper ex parte contacts between lawyers and judges. But you also reported, in the same memorandum, the view of some conference participants that "[j]udges should work to be more open and friendly toward lawyers, both in public and in court." Some federal judges socialize a great deal with lawyers outside the courtroom, occasionally coming close to -- or arguably crossing -- the line of improper ex parte contact. Other federal judges take a stricter view and avoid interacting with lawyers outside the courtroom, sometimes to the point where they are regarded as cold or unfriendly by members of the bar. What are your own views on bench-bar relations and appropriate lawyer-judge interactions outside the courtroom? On a related note, do you find your lofty perch as an exalted federal judge to be somewhat isolating? And if so, do you have any suggestions or recommendations concerning how to address this problem, within the constraints supplied by judicial ethics? The friends I spend the most time with now are pretty much the same people I spent time with before I got this job, and with few exceptions, they are not lawyers. Even among the exceptions, they are generally not lawyers that I have dealt with as lawyers, they are friends who happen to be lawyers. For example, my wife and I have dinner two or three times a month with a couple, one of whom has been with the Department of Justice for the last 4 years. We met when we were both in college and have remained friends since. She is a, of course, a lawyer, but it has no bearing on our friendship. We have plenty to talk about that has nothing to do with law or cases. The job of being a judge is by nature somewhat isolating. I think the average person hesitates to approach a judge, and the average lawyer is even more reluctant to do so. For better or worse, people just don’t drop in to see federal judges. The courthouse is, at most times, a quiet, almost library-like place. Maybe it is the body-cavity/MRI/bomb-sniffing-dog security searches conducted upon entry to this building that keeps people away in droves? For whatever reason, becoming a federal judge does not expand one’s social interaction opportunities. People also treat you differently when they learn you are a judge. It is odd to see how conversations change when I am introduced in a social setting as a judge. Even among state court judges, the presence of a federal judge often is the occasion of a some notice. Despite rumors to the contrary, judges are ordinary men and women. Yet, it is difficult for most folks to see us that way. We are treated a little like priests, ministers or rabbis–as though because of the role we play in the legal profession, we are viewed as being “on duty” at all times. When one of my colleagues, an avid golfer (Gene E. Brooks, in whose memory the famed " Brooks Cup” is named–see below) retired a few years back, he remarked “Damn, now I have to buy a putter” alluding to the fact that a judge playing golf with lawyers is generally conceded many putts. I don’t know what the best solution to the isolation of judges is. I certainly don’t subscribe to the view that judges should be treated as if they know the secret to walking on water, but I do think that the institution of judging is entitled to due regard. It is a difficult mix to get it just right, so that too much smoke is not blown up judges’ robes, yet so that they can be treated as reasonably normal people when they are not in the judicial arena. I try to be cordial with all lawyers, both in the courtroom and out. One phenomenon of the business, though, makes for some odd situations, and that is this: there are just 5 Article III judges in this district, and probably 10, 000 or so lawyers. Many, if not most, of the lawyers recognize us. But the chances of us recognizing or remembering more than a few hundred of them is slim. My ability to recognize lawyers I pass on the streets has also diminished with the advent of continuous casual days. A few years ago, if I saw someone on the street wearing a suit, carrying a briefcase, about 90% of the time, it was a safe bet that the person was a lawyer. Today, many lawyers have their data in a Palm Pilot or BlackBerry, and are wearing golf shirts and slacks (or the female equivalents.) As a result, I try to make it a point to say hello to everyone on the street with whom I make contact. (We may need to think about putting a “lawyer suit” requirement into the Rules of Professional Conduct, for ease of identification). There are no perfect answers to your questions, but I think judges ought to attend bar functions and CLE programs as their schedules permit. I think it is important for judges to interact with lawyers in those settings, and to be cordial to all lawyers, whether they practice in federal court, whether they are generally represent plaintiffs or defendants, and so on. Lawyers and judges should be able to have a meal together, but they should not buy each other’s meals. It is a mistake to talk about pending cases, and if you talk about closed cases, a judge shouldn’t say anything to a lawyer from one side of the case that he/she wouldn’t say to the lawyer who was on the other side. I think it is a good thing that lawyers and judges come into contact in social settings but I don’t think that a judge should be invited to a lawyer’s social gathering simply because he/she is a judge. 9. You have been actively involved in the area of courtroom technology, serving on several committees that have examined ways to integrate technology into the courts. Your own high-tech courtroom features a fully integrated Video Evidence Presentation System, which attorneys can use to make presentations and to share exhibits with the judge, jury, and opposing counsel. What are your thoughts on how technology is affecting the practice of law, both with respect to courtroom practice and also more generally? I could be described as a “burn-out” on technology issues. After spending at least a dozen years on technology issues in this court and on the Judicial Conference committee which was then known as the Committee on Automation and Technology and related groups in the 80's and 90's, I have tried to drop out of that world to become simply a happy user of these advances. So I hope you are not disappointed that I do not pretend to be an advocate of the cutting edge of technology and the law. With respect to courtroom technology, the technological ability to present documents digitally, to use video and audio enhancements to present evidence and other media can make for more efficient and effective presentations. Some lawyers understand how to best use these emerging media. Others get lost in the details. The important thing to remember is that the heart of advocacy is communication, and that the media ought to be used to further the quality and effectiveness of that communication, not to merely increase the quantity of it. You used to see lawyers (or more accurately, their paralegal) rolling their carts overloaded with banker’s boxes of documents into courtrooms. Now they come with a laptop and a couple of CD’s or a flash drive. But in the end, what will turn the tide in a case is usually a handful of documents rather than a banker’s box full of them. The really good lawyers focus their presentations on the key documents, and understand that the weight of the evidence is the importance of it, not the tonnage. More generally, technological advances allow all of us in the law business to do more things and to do them faster. Years ago, only the mega-firms with associates chained to their desks through the night could crank out 30-page briefs overnight. Now, even a solo practitioner can do that, with Westlaw/Lexis, word processing, etc. At times, I wonder, though, whether the ability to do more, and to do it more quickly has improved the quality of the practice of law, and I am pretty much in the camp of those who doubt that it has improved the quality of life in the practice of law. We are all tied to our cell phones, BlackBerrys, laptops, etc., even when on vacation. The business of law thrived for a long time without these eternal umbilical cords. I wonder if the 24/7 links to the work world are an improvement. When attached as exhibits to pleadings and motions, I see emails and faxes that are rifled back and forth between lawyers at the speed of light, and I think that often, things get written in those rocket missives that would not be said in a phone call (and I don’t mean a voice mail), or a face-to-face meeting, or which might be re-written and toned down if the author would wait for the ink to dry before sending something like that to an opponent. There is a lot to be said for letting a disagreement cool down for a little while before thinking about tossing a Molotov cocktail into your opponent’s office. I can only imagine what is written and said among lawyers that never comes to my attention. Most of all, I think we all need to keep in mind that the lawyers we deal with are fellow professionals and should be treated accordingly. Also, because we all have many different cases to deal with at any one time, we all should allow for a reasonable amount of time to respond before moving forward with action. Finally, everybody needs down time, away from the stress of this business, to keep recharging the batteries which power us to keep moving on. One area of law in which the speed and volume of litigation seems to have overtaken the ability to reason through problems is patent law. Because the life of a company (or several companies) can depend on a patent, those cases are staffed like professional hockey teams, with lines of attorneys coming on and off the playing surface simultaneously. Sometimes it seems like you can’t finish reading a moving brief before the response and reply briefs are filed. So, I guess you can conclude that I am not sold on the idea that more and faster is always better. This is a profession after all, not a production line. I understand why Westlaw and Lexis scoop up everything written by any judge anywhere into their databases. It is simple: the bigger the information pool, the longer the users’ are online searching for supportive cases, the larger the bill. I also understand why lawyers desire to have the most recent decisions and cases decided by the judge before whom they are appearing. But law is not made in district courts. District court decisions have no binding precedential value, not even in the very court in which they were decided. I don’t think lawyers should spend so much time digging through district court decisions. Because Westlaw and Lexis are constantly expanding their collections of district court decisions, the temptation to spend hour after hour reading through these decisions is overwhelming. But it costs a lot of lawyer time and client money, and for little benefit. I also recently noticed what I consider a misuse of electronic publishing in one of my cases. One of the parties submitted what appeared to be an uncontroversial request for a stay pending a decision to be made by the Multidistrict Litigation Panel. I signed the proposed order granting the stay without giving it much consideration. It was essentially a simple, one line order indicating “stay granted.” The opposing lawyer promptly filed a motion to reconsider indicating that the stay was actually quite controverted. In the meantime, the lawyer for the party who obtained the one-line stay order must have sent it to Westlaw and it was placed in the electronic data base. There are similar cases pending throughout the country, and I presume that lawyers who obtained the stay are submitting a Westlaw cite to it in other cases for the same client. However, after looking at the details of the issue on reconsideration, I vacated the stay and remanded the case to state court. The stay should not have been granted in the first place, and I would never have sent such a routine order for publication. However, it remains in the Westlaw database with no guaranty that it will be linked with the subsequent vacation of the stay. I strongly support the public’s right to know what happens in litigation but I am not pleased with the distorted view that can result from situations like this. If it were up to me (and I realize that it is not), the matters to be published from district court rulings would be few in number, and would be published only with the permission of the issuing judge. 10. Judge Tinder, you know the drill -- please give us the inside scoop on your magnificent judicial robes! Actually, I prefer to not wear a robe even in hearings, unless one of the parties is present in person for the argument or hearing. But if non-lawyers are likely to be in the courtroom, I always wear a robe. I think members of the non-lawyer public would be confused if I did not wear a robe in the courtroom. I have 2 and ½ robes. Two of them were manufactured by Collegiate Cap & Gown. The robe I wear the most is a light weight polyester-type material, and you could call it my working robe. I bought this to have something that wouldn’t be too warm in the courtroom. As you might guess, it can be a little difficult to maintain a constant and comfortable temperature in a century old courthouse. Comfort is the key to being able to outlast the lawyers during a court session. One of the secrets of judging that I learned by trial-and-error is that the sleeves of the robe need to fit in a way that does not interfere with note taking (or today, the use of a computer keyboard.) The first robe I had (which I will describe below) has very large, floppy sleeves. The sleeves look fine while I am sitting or standing, but when I tried to take notes in this robe, my arm would get trapped by the bulky sleeves. That trial career of that robe did not last long. The first robe I obtained could be described as a ceremonial robe. It was presented to me by the Indiana State Bar Association when I started this job (that is a custom of the bar association.) It is a heavy material (wool, I assume) and has the large sleeves described above. While it looks good in a ceremony or for a “photo op,” it is about as warm as wearing a down comforter in the courtroom. The use of this robe is reserved for non-litigation ceremonial purposes, and it only comes out of the closet about half a dozen times a year. The half robe is shared with our Chief Judge, Larry McKinney. Both he and I also work in the Terre Haute division of the court, about a 70 mile drive from Indianapolis. We bought an inexpensive robe together to keep there so that we wouldn’t have to carry one back and forth. Our Chief claims to be taller than me, and he is, but not as much taller as he thinks he is. We bought a size that fits him, so it is a little big on me, but not as big as our Chief thinks it is. We are never in that division at the same time, so we never have to fight over the use of it. By the way, our Chief is one of the truly naturally amusing people of the world. I would describe him as sort of a cross between Garrison Keillor and Dave Letterman. I mention that because it is very difficult to ever get the better of him when trading jokes. However, this shared robe was my only opportunity to pull one over on him. (I hope that he never reads this blog to discover this.) It was my job to purchase this robe. Well knowing that Larry is a Presbyterian, I purchased it at a Catholic supply store. Actually, it is not a judicial robe at all, it is a choir robe! I don’t know who the manufacturer is. Whenever I hear that our Chief will be trying a case in Terre Haute, I smile. The thought of a Presbyterian wearing a Catholic choir robe for several days at a time is my small effort at missionary work. Of course, I suspect that he is also amused when he hears about me trying cases there, thinking that I will be swimming around the courtroom in robe ten sizes too big. I try to remember to have my working robe dry cleaned about twice a year. If I forget, my helpful staff is not shy about reminding me that I am overdue by holding their noses when passing by the bench. The ceremonial robe gets cleaned about every other year. If the shared Terre Haute robe has ever been cleaned, it was done without my knowledge. --Where does Judge Tinder buy his neckties? --Judge Tinder has partied backstage with which musical group? --Is there any truth to the rumors of Judge Tinder's checkered frat boy past? So tune in next week -- same blog time, some blog channel -- to get the 411! * You can speculate to your heart's content concerning A3G's identity, and A3G will confirm or deny nothing (other than to refer you back to her blogger bio). But let the record reflect this one indisputable fact: A3G is not a fatty!!! I have known the Judge and his family for a long time....this interview (and part II) give everyone a great insight to a fantastic guy and a great judge. Wow, I'm sure Congress will be glad to know that $158k/yr is a living wage, as long as there are no children and it's not the primary income, so they can ease up on their push for a $75 minimum wage. And knowing that successful private lawyers make ungodly amounts of money doesn't have any bearing on the adequacy of the 95th-percentile salary in question. That information is relevant only to the question of recruitment, and as the Judge noted and your enthusiasm makes clear, people would do the job for free, so it's actually only the sub-question of recruiting those among the best and the brightest who are nonetheless not bright enough to subsist on low six figures. I'm not trying to say that judges shouldn't be paid handsomely, but I do find it offensive to hear about what a sacrifice it is for public servants to have to accept an income merely 3.6 times the household median. All of that said, I don't mean this to be a flame, because I do very much enjoy the content and tone of your blog, despite my rather different politics.